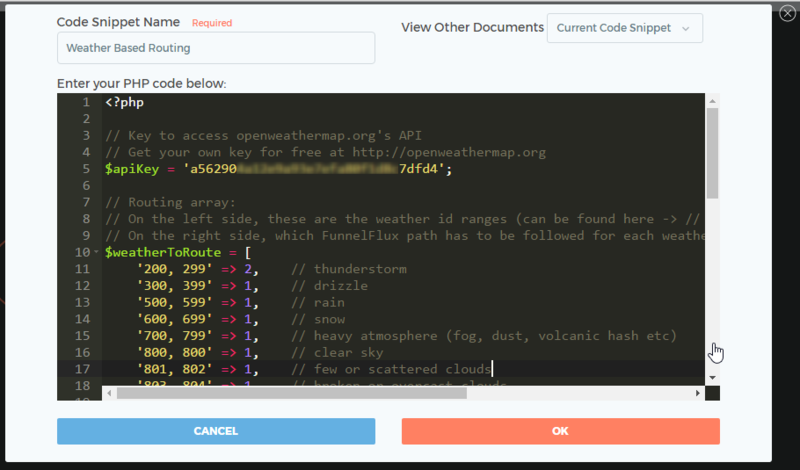 Want to redirect your visitors to different landers/offers based on their local weather? Whether this is even useful or not, this is a good way for us to demonstrate the power of PHP nodes as well as multiple output routes. The traffic is first being filtered by that "Weather Based Routing" PHP node. It is then being sent to 2 different pages, depending on the result of that filter. Before I show you the content of that PHP node, give it a try and enter that funnel yourself by clicking here. I'll give you the full code below, but first I want to explain how the filter decides to route toward one node or another. It's really simple. They have a path number. Path 1 to go Google Image Search, and Path 2 to go to FunnelFlux's website. return 1; ----> to follow path 1.
return 2; ----> to follow path 2. You can have up to 64 exit connections per PHP node. It is then possible to create very complex logic depending on your own specific needs. Here a PHP developer can help you create elegant and powerful routing solutions that are not possible with a basic UI... or any other tracker for that matter. // On the right side, which FunnelFlux path has to be followed for each weather condition. In the future we plan to have example PHP and JS nodes with basic UI elements to configure properties. This will suffice for small, simple functions but for advanced functionality we highly recommend letting a PHP developer get familiar with the capabilities of these nodes.